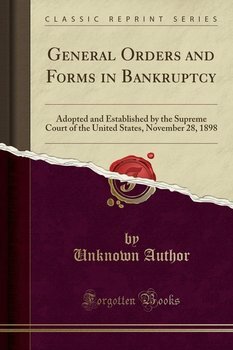 Whenever, by reason of a vacancy in the office of trustee, or for any other cause, it becomes necessary to call a special meet ing of the creditors in order to carry out the purposes of the act, the court may call such a meeting, specifying in the notice the purpose for which it is called. A Treatise on the Law of Personal Injuries, Vol. 1 of 3 Bailey W. F.
Standard Encyclopedia of Procedure (Classic Reprint) Tuttle Edward W.
Michigan Reports, Vol. 117 Reasoner James M.
Cases Argued and Determined in the Supreme Judicial Court of Massachusetts Tucker George F.
Reports of Cases Determined in the Appellate Courts of Illinois, Vol. 88 Newell Martin L.
Pittsburgh Legal Journal, Vol. 54 Vaill Edward B.